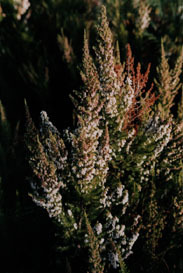 Growth Habit: A small to medium sized woody shrub, Spanish Heath can grow to 1..5 metres height in suitable conditions. It usually grows as a dense multi-stemmed bush however inappropriate slashing thickens it up so that can becomes more hedge like. Leaves are small, fine and pine like. Flowers: Small, rounded, bell shaped flowers are white to pale pink in colour and are borne in large clusters at the end of branches. Fruit/Seed: Each Spanish Heath bush is capable of producing millions of small, speck like seeds. Dispersal: Wind and water easily carry the small seeds. Any machinery that passes through or over the bushes when in flower and/or seed is likely to pick up and carry the seed further. Distribution: Spanish Heath can be found in most areas of Tasmania. Originally planted for the dried flower market many years ago, it now is well established along roadsides, in run down pasture and in wastelands. Once it is established in these areas, it is able to invade surrounding bush lands. Spanish heath is an environmental weed. It does not survive in well maintained and grazed pasture. Status: Spanish Heath is a declared weed in Tasmania. It has little economic impact as it does not invade agricultural land, but the potential costs of removing it from conservation areas is enormous. It is capable of completely overwhelming the native vegetation. Present roadside management seems to be enhancing the spread of this weed. Spanish Heath is very invasive. Now that it is well established on the road sides its range is rapidly expanding. It is now so common that many people think it is a native. Indiscriminate roadside slashing appears to be spread the weed. Once established along the roads it moves into bush lands, completely dominating the under-story and out competing the native heath land vegetation. Similar Plants: The native Ericas tend to be smaller, more sparse bushes. They flower at the same time as Spanish Heath but can be distinguished from it by having more angular flowers which are usually red or white in colour and leaves which are to more prickly and triangular in shape. Slashing (Jul – Oct). Slashing while a temporary measure will stop flowering/seeding if done during winter (flowering period). Hand pulling (Feb – Jul). In autumn and winter (pre flowing) when soil is moist, hand pulling and grubbing is easy control method for minor infestations. Ploughing (all year). The use of cultivation in dry sandy soil with a cultivation within 3 years has given control. Education (all year). The general public needs to be educated that this plant is an environmental weed and should not be planted especially along roadsides. Spraying (Nov – Feb). Herbicides such as Grazon can be used as a foliar spray (2.5 ml Grazon DS R/L). Glyphosate has also been suggested. Both Grazon and glyphosate could be applied (neat) as a cut stump or basal bark application. N.B. Always check the herbicide label before use.